Polka Dot Overload | Sewing, knitting & vintage projects, tips, tutorials and cartoons! : Happy Birthday, Cartoonist Husband! Masheka and Mikhaela celebrating Masheka's birthday at Waxy O'Connor's, London, originally uploaded by M1khaela. My sweetheart Masheka is 37 today, and not far from celebrating his first Father's Day! The picture above is from a year ago today, celebrating his birthday at a pub in London with a giant fake tree growing up the middle (not pictured). 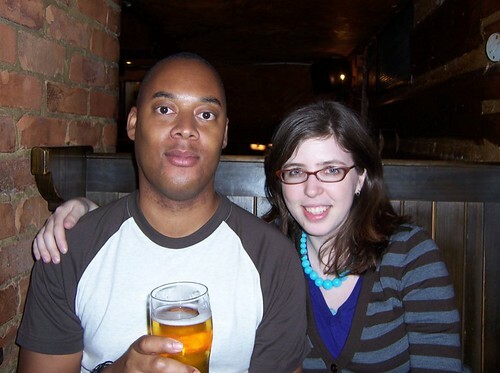 Today is also the 6th anniversary of our second date, on May 19, 2004--I figured things were going well when I got invited to meet all his friends for his 31st birthday after just one date! I wasn't feeling well enough yesterday to walk to the store to get him a card, but I made a handmade cartoon card instead, which is always nicer anyway--I'll take a photo of it if I get a chance. Speaking of birthdays... I'm turning 30 in less than two weeks! Normally I suppose that would be a Big Deal, but I haven't made any plans since I might be otherwise occupied... and I think Cartoonist Baby's birth day just seems more significant. What an adorable photo! I would much rather receive a handmade card, too. So, it's possible you might have to share your birthday?! Happy birthday to him, and (soon) to you and baby! I will be turning 30 this year also, and I am not sure how to celebrate it either.